Silver award for Friends and Heroes! Friends and Heroes' Lent Resource Why does Easter matter? won a Silver Award in the category of Best DVD Training Resource at the Media Awards organised by the Christian Broadcasting Council. The award was presented by comedian Tim Vine at the prestigious award ceremony in London on May 19th. The judges commented "It's an excellent resource making use of modern media and aimed at the family. So encouraging to see such well conceived and attractively produced teaching material, bucking the trend towards Christian entertainment. The choice of Steve Gaukroger for the Biblical material only adds to the value of this superb resource. A very good quality production on an important topic. Excellently put together and very useful. Well done Friends and Heroes." Why does Easter matter? is a new five-session DVD-based family and group study with Biblical content by Revd. Stephen Gaukroger, which is ideal for churches to use as an all-age Lent resource. The award was received by Brett Pitchfork, Friends and Heroes new UK Marketing Manager who said "I've only been in post one week and I'm collecting awards already - long may it continue. What a great resource!" Click here to find out more and to order your copy. Brett Pitchfork recently joined the team at Friends and Heroes as Marketing Manager. Brett comes with many years experience of Publishing and Marketing in the Christian sector and will initially work alongside Dave Carlos in the UK, to increase the reach of Friends and Heroes into churches, schools and homes. Brett is also a musician and worship leader in his church. "As the father of two boys, I understand the value of communicating Bible truths in new and dynamic ways," says Brett, "the impact of Friends and Heroes adventures on the lives of children should not be underestimated and I'm thrilled to be part of the vision to see these great DVDs getting into the hands of even more children." Church of God International Children's Leader endorses Friends and Heroes! Friends and Heroes Bible Curriculum recently received a glowing endorsement from Rev. Tony P. Lane, International Coordinator of Discipleship and Children’s Ministries with the Church of God International Offices in Cleveland, Tennessee. "Friends and Heroes curriculum is a great adventure through the use of video. I am impressed with the fact that the vision of this company is global, providing the experience in many languages on the same DVDs so that children around the world can experience the Gospel in their own language. The website allows the children to further their experience and learn even more about the biblical characters. The project is practical and is done with excellence! In an age when many churches are looking for media-driven curriculum we need more resources that are telling the stories of scripture in an entertaining, yet biblically based way. Churches, as well as families, will benefit from this tremendous resource as children encounter the living God and His story from His Word!" 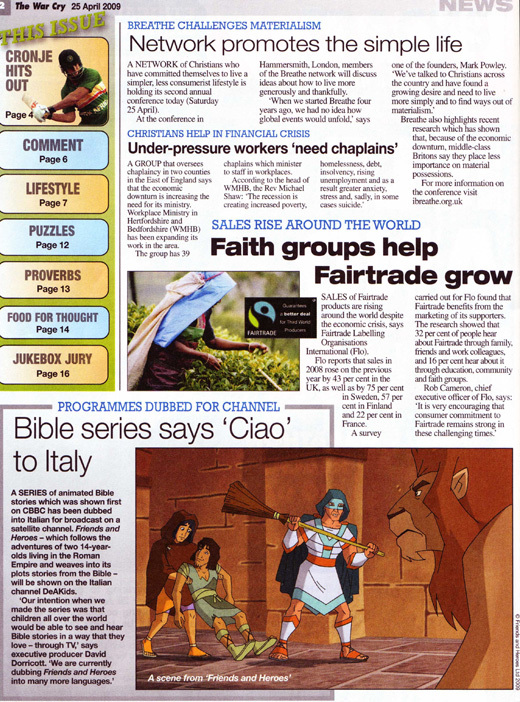 The Salvation Army's newspaper War Cry covered the news that Friends and Heroes is to be shown in Italy on the DeAKids channel. You can read more about this here. SAT-7 KIDS broadcasts Friends and Heroes in Arabic and Farsi in the Middle East. "Tami Adewunmi watched the (Friends and Heroes) DVD with daughters Rebecca, seven, and Monique, four. The family regularly attend a local church and the children are very involved in Sunday school activities. Monique Adewunmi said ‘It was very good. We really liked it and one of the sisters was called Rebecca like my sister.’ Her sister Rebecca added, ‘It showed Monique and me how to forgive like in the Bible.’"